When are you going to get your first results of the simulation? [Either in time or in number of simulations marked] And what are you planning to make public? Will there be a sensitivity score or scores? I would think that the sensitivity would be lower for particles with shorter lifetimes which would have a vertex close to the centre and would therefore be harder for us to differentiate, so I am guessing that you’ll need a sensitivity for each scenario, so nine in total. Are you going to try to combine these into a general formula for all energies / lifetimes? I can think of two scenarios where you might get ‘false positives’ – either non-vertices which are marked in error or vertices which are correctly marked but are due to known particles. You could probably use the simulations to try to address the first type by finding the right balance between false positives and false negatives for known decays to get the cleanest results. Are you doing this? And how are you addressing the issue of vertices from known particles? We will be doing the calibration soon (next month?) once all simulated events have been classified enough times. I imagine we would share the results of the calibration in a future blog post. There certainly will be a separate sensitivity per each set of parameters. You’re right that very short lifetimes should have smaller sensitivity, but also the sensitivity should drop at large lifetimes once the decays are no longer well-measured in the tracker. There is likely a sweet-spot for moderate lifetimes. We’ll definitely interpolate / extrapolate to estimate the efficiency as a continuous function of the parameters, but the range of parameters will be limited by those of the simulated events. As for false positives, yes we are also going to use the simulations to check how often you identify vertices where there is no true decay. We also have simulated Z decays to muons pairs, with no accompanying Higgs boson – these simulated events will be purely used to study such false positives. But we will likely not be able to distinguish different reasons for false positives such as known SM particles, interactions with detector material (future blog post? ), fake track / random combinations, etc. And it’s not so important to. All we need to know is the rate of false positives, which will be checked by the rate of data events with only one (large) displaced vertex found. If I understand correctly, there are 3 choices for the mass of the “a” boson and 3 choices for the average lifetime of the “a” boson, but what SM particles the “a” boson decays to is determined by the mass. I would have thought that there would be 3×3=9 possible parameter combinations to simulate. The same answer, but a different equation. Statistics is not my strong point, but I am curious where the “3×2+3×1” comes from. Right, 3×2+3×1 = 3×3. 🙂 I had just broken it down differently. Can you post a Feynman diagram for what you describe? Is it p + p –> H + Z or p + p^- –>H+Z ? Or is there an intermediate virtual Z ? Yes, there’s a virtual Z in the middle, which “radiates” a Higgs. So we’re actually Higgstrahlung Hunters? This is going to make an awesome tee shirt. um….don’t protons consist of two ups and a down? Don’t you need an antiproton for that antiquark? Actually, the proton is a bit more complex than that. If you were to be able to take a snapshot of the quarks at a moment in time you might find two ups (and a down) or you might find five ups and three anti-ups, or four and two, etc. So when two protons collide there is a chance that an up could interact with an anti-up quark. To Brownfox1: thanks! So you’re relying on vacuum polarization to provide anti-quarks. That’s a perturbative effect in electroweak theory. How good is the math for the strong interaction? I guess the LHC designers had a lot of faith in that math, since they went to the trouble of building colliding beams of protons and protons, not protons and antiprotons. That’s quite a €10B bet. I’m impressed. As I understand it, the situation within the proton is somewhat different from the vacuum, but you’ll have to rely on the scientists for the maths. Many previous accelerators, including some of those at CERN, collided protons. They performed as expected, so I don’t think it was much of a risk. To brownfox1: good comments. They imply also that the building of the proton-antiproton colliders assumed that some antiprotons could be created and stored long enough to build up a big bunch for injecting into the collider. Which brings me to what may actually be a point: how, if at all, does this project depend upon knowing the frequency of quark-antiquark collisions in total? And relative to what? Please allow me to add that one can read all the hep books out there, but nothing is as enlightening as gossip like this. Many thanks to all involved. Actually the anti quark distributions of the proton are quite well known from many previous collider experiments and from the LHC itself. 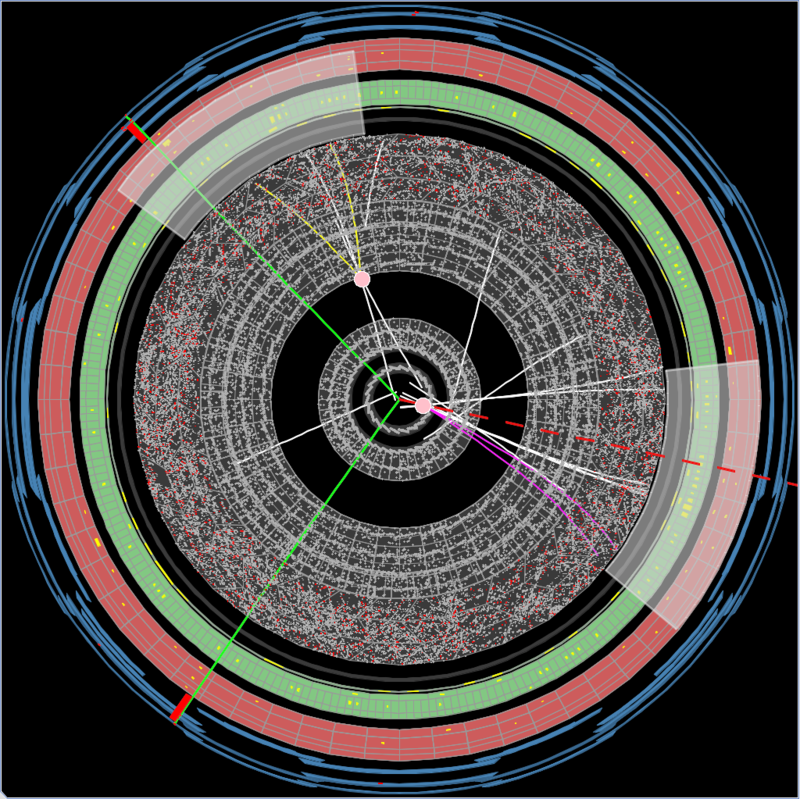 The Z boson is most directly produced by q qbar annihilation at the LHC. The rate is predicted to about 3% accuracy, and is measured to about 2% accuracy by ATLAS. They agree within these uncertainties, and also the differential distributions as a function of the angle from the beam, and as a function of the transverse momentum of the Z, also agree! Andy: I’m familiar with the SM at the level of one reading of Quigg 2nd ed. Would you please suggest some reading on your latest reply, especially on the ‘antiquark distribution of the proton’? It would be very much appreciated. I do understand how get the amplitude for weak annihilation of a q qbar pair into the Z. Thanks! I’ve borrowed a copy of Q&L. It’s dated (1980: no top yet) but does not seem wrong, and fits nicely between Griffiths and Quigg. Anyway the upshot is I gather that the anti-up luminosity is very roughly about the same as the proton luminosity. I also looked Dittmaier et al but could not find separate cross sections for Higgstrahlung and gluon fusion. Fascinating stuff, anyway.